This weekend we got out into the country. On Saturday there was a hike to Lindeman Lake (don’t listen to your guidebook, it’s definitely not “easy”) and afterward, there was time to check out a few local farm markets. I was hoping we could find a flat or two of local strawberries, but since we were nearing the end of the afternoon, everywhere seemed to be sold out. Our first stop was Wisbey Veggies in Chilliwack where I walked out with 2 very full bags full of local farm fresh produce for $20. Beets, turnips, broccoli, cauliflower, tomatoes, snow peas, new potatoes, carrots, raspberries, zucchinis and mushrooms…all locally grown, all so delicious. A few minutes away, we discovered a goat cheese dairy selling all kinds of goat cheese products from ice cream to yogurt to gouda! I walked away with cheese curds (not goat) and some goat cheese feta. I was already imagining all the menu possiblities. On Sunday, after a big breakfast and a little garage sale snooping, we decided to head out to visit our CSA farm in Langley for their open house weekend. It’s a beautiful farm and we got a great tour from the very enthusiastic farmer, Stephen. We also got to pick out some seedlings to take home and harvest some of our own rhubarb and greens (kale, mustard, chard and arugula)! We even dug into the farm’s cooler and into a tub containing mouldy leeks. Stripping off the gooey outter layers revealed a perfectly good leek, so we took a few of those home too. I think it’s safe to say that when you harvest your own food, it tastes so much better and you get bragging rights which is always a good thing. After looking through my haul on Sunday evening, I got to work. First I tackled the beets. I knew I wanted a beet and arugula salad topped with feta. Recalling a similar salad I made last summer, I decided to stick with a good thing but still make a few tweeks here and there. 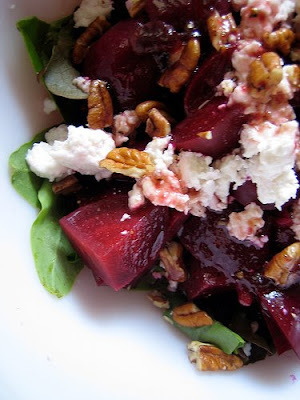 The beets were incredibly sweet and worked so well with the feta and the tangy dressing. It was a beautiful, beautiful thing. For the new potatoes, I took the simple road. Boiled, buttered and sprinkled with fresh herbs from my garden. 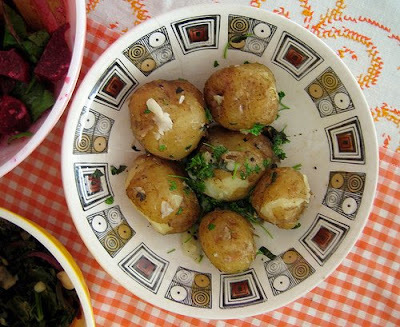 The mint made this dish and made the potatoes sing. 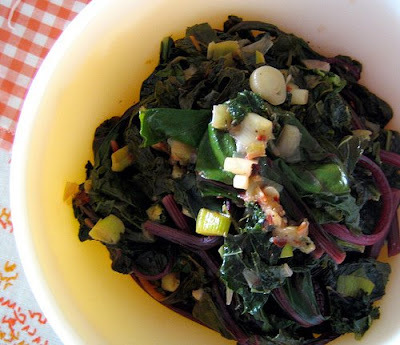 I couldn’t leave well enough alone, and as i gathered the beet greens, I decided to make use of the kale and chard as well, braising them simply with the leeks and a lemon. It was a farm fresh dinner from start to finish. Boil potatoes in water until tender. Drain. Coat with butter, fresh herbs and salt & pepper. Serve. Boil the beets until tender, about 40 minutes. Cool slightly so that removing the skin from the beets isn’t too painful. Further chop the larger pieces of beets, if necessary. Set aside. Mix the dressing by combining the jam, olive oil, mustard, vinegar and salt and pepper until thick. Adjust seasonings to taste. 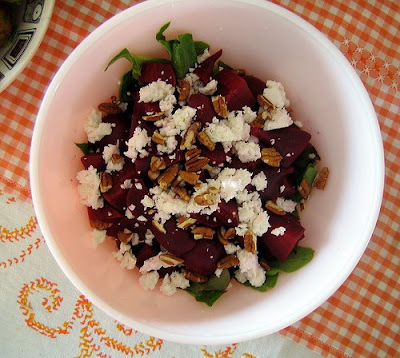 Scatter arugula on plate, then the beets, feta and pecans. Drizzle with dressing and serve. Rinse the greens very well to get rid of any dirt hidden within the leaves. Remove the tough ribs from the kale and discard. 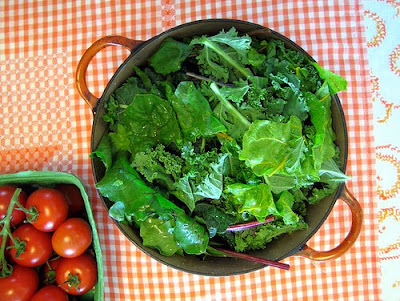 Chop the greens and set aside. In a large pot, heat olive oil and saute the leeks and red chilies until fragrant. Add in the toughest leaves first (kale) and then the chard and then the beet greens. Reduce heat. What looks like a massive amount of greens will soon wilt into a very manageable amount. Add in the lemon juice and zest and sprinkle with a bit of salt and pepper and stir about until all the leaves become wilted and tender, about 10 minutes. Serve. Great post! I love the pics — not to mention the cute table cloth peeking out from the behind all that seasonal goodness! You would've been 10seconds away from our place on the way to Lindeman Lake. We did the hike on Friday and The Yellow Barn in Yarrow for vegetables on Saturday. 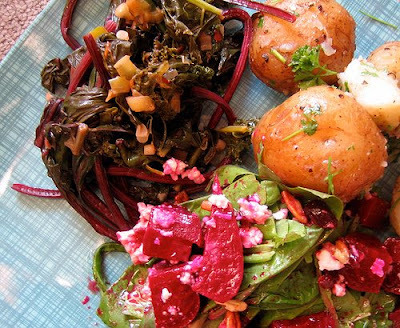 I love beets so any beet recipe is a good one! Can I come over for dinner? Seriously, this is totally my kind of meal – all delicious sides and totally healthy. I just want to cry reading about those beets – my husband won't eat them and they are so gorgeous in our markets right now. Beet salad for lunch tomorrow. Thank you for the inspiration. I would love some singing mint potatoes on my plate right now. And it's not even 8am. It wasn't until recently that I discovered the true heaven that is beets and goat cheese salad. Divine. I'm totally addicted to all manner of greens, and eat them most days for lunch. This meal is right up my alley! Thanks for the reminder that I love mint in potato salad. Sounds like summer is officially here! Sounds like a lovely meal. Wish I could have been there for it. Makes me want to drive out to the country to find some local stands. I tried to look into CSA in the Vancouver area and couldn't find anything before. Good to know that there actually is an option! This meal looks delicious. Especially the beets and feta yum!! hell yes! goat cheese and beets love each other so much. I'm so jealous. I wish my csa box would get with the beets already! I'm so jealous of your fresh local produce! I have yet to visit a local farmer's market this summer. I must get to one soon! I don't think I've ever tried beets with goat cheese and pecans before but I am really tempted by the image of yours! Love that beet salad – how fresh and summery! I totally get this post. On Monday I went to volunteer at the gardens that our local Hunger Task Force maintains. I weeded and harvested for a couple of hours and then got to take home a bag stuffed with food – beets and collards, but also new onions, broccoli, and sugar snap peas. I immediately went home and braised the greens (the collards and beet tops) with the onion, some garlic, oil and a splash of vermouth. Then I toasted up some ciabatta, grated some grana padano over the greens and dug in. Unbelievably good. And I agree with you – food absolutely tastes better when you pull it from the ground yourself. I'll be trying your beet salad after I hit the farmer's market this weekend for some arugula. Hey Al! I'm not much for boulder scrambling so we had to stop for a break, mid rock scree for view of the lake. It was beautiful! And beets are awesome, I agree. Dana, my husband isn't a fan either but he loved these beets! I think because they were local and fresh they just tasted so much sweeter. Jess, I think singing potatoes can be sweet any time of day! I know, Amanda, it's a great pairing. Mari, you'll love this salad, it's so great. It's definitely my most favorite salad ever. Aimée, I know, mint is so perfect! Hooray for summer! Mrs. L, I think a drive to the country makes for a wonderful weekend! Go for it. Thanks, Tania, it was so delicious. There are a few options actually, eatme! I think most of them are full already though. Next year! Daily Spud, I'm glad we can share a brain! This is my kind of dinner. This is so great! You've gotten me so excited for my CSA, which begins in a few short weeks (Chicago weather, it's full of surprises) and all the fresh, fresh greens and vegetables I'll be able to enjoy! Loved these pictures, btw. Shannalee, our csa hasn't started yet either, but it was great to visit the farm! That is the best feeling in the world–coming home with loads of fresh veggies and letting inspiration strike. the leftoverist, i agree, completely! I've been mulling over joining the CSA here in Santa Barbara for a while now & I think you've cinched it. I believe I'll sign up for the fall season now! amazing, I'm lusting over that dinner like nothing else… it looks so vibrant! perfect for summer, lots of veggies… yum! woh! gorgeous spread jeanette! thanks for sharing those recipes too. Laura, I'm sure you'll love your CSA. I can't wait for mine to really begin. Thanks Liz, it really was the perfect summer meal. Gine, does anyone hate potatoes? Your tablecloths and napkins are great! Your style (with food and colors) is so playful. Thanks for sharing!